Claire provides training to local authority schools, working with a number of different providers throughout the West London areas. In addition to schools, Claire has provided tuition to many children and adults on a one to one basis, ranging from novices to people looking to gain confidence and take part in sporting events. Claire’s time is especially sought after by lady cyclists looking for a lady instructor, and people looking to take up cycling for leisure purposes. Claire is a Cycle Instructor, fully accredited by the Cycling Touring Club (CTC), having passed the National Standard Instructor training course. 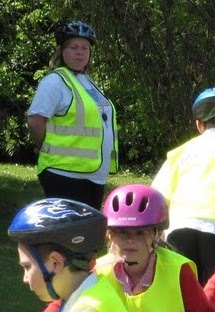 Claire is qualified to teach cycling to Levels 1, 2 and 3 of the National Cycling Syllabus.Claire is qualified to administer first aid, and all cycle training activities led by Claire are underwritten by the CTC’s insurance scheme for instructors.